One of every three people in the U.S. will develop shingles during their lifetime, the majority of whom are over 50 years of age. Shingles, which is caused by the varicella-zoster virus, the same herpes virus that causes chickenpox, is characterized by a painful, blistering rash that can have long term consequences after the rash resolves. While chickenpox is highly contagious, shingles is not. However, anyone who has ever had chickenpox is at risk of having shingles, as the virus lies dormant in nerve cells and can reactivate many years later. The probability of having shingles increases with age, and is highest for those with compromised immune systems, those taking immunosuppressant medications, and those with cancer undergoing chemotherapy. 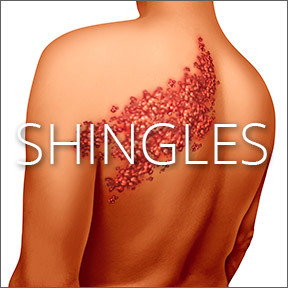 A case of shingles begins with redness followed by blisters, and usually appears on just one side of the body. The rash typically follows the path of the nerve where the virus has hibernated, with the breakout generally occurring on the trunk. However, shingles may occur on the face and neck and may also involve the eyes or ears. There are warning signs of aching or burning in the area where the rash eventually appears several days later. The area may be very sensitive to touch or may feel itchy or numb. Some people develop additional symptoms such as headache, fever, swollen lymph nodes or general flu-like symptoms. The itchy, painful, inflammatory condition generally runs its course over three to five weeks. Although shingles is not life threatening, about 20% of the people who develop shingles are left with a condition known as postherpetic neuralgia, which causes burning or deep aching pain to remain long after the rash has healed. The condition, which is diagnosed after 3 months of recurring or persistent pain, occurs when the shingles outbreak damages the nerves that register pain, pressure or touch, creating an interference with normal nerve messaging. Unfortunately, the condition, which can be excruciating, can last for months and in some cases a year or longer. The risk of developing postherpetic neuralgia increases with age, the severity of the shingles rash, the location of the rash, and the current state of health. Antiviral medications taken within 72 hours of developing the rash can lessen the risk of complications and lingering pain. Because more than one million new cases are diagnosed each year and there is no cure, the Center for Disease Control (CDC) recommends that everyone over 60 years of age, with the exception of those with immunodeficiency or a history of allergic reactions to vaccine components, receive the shingles vaccine. The vaccine has been shown to be 70% effective in preventing shingles, and those who do develop it often have a limited outbreak, decreased pain and a reduced chance of developing postherpetic neuralgia. Alternatively, micronutrient therapy may provide safe, natural and effective methods for treating shingles outbreaks. Some studies have demonstrated that vitamin C with bioflavonoids provides immune support, boosting white blood cells that fight the virus, while reducing postherpetic pain. B complex vitamins support nervous system function and promote healing. Vitamin B12 in particular has been shown to provide pain relief, reduce duration, and help prevent a painful aftermath. Lysine, an essential amino acid, has been shown to effectively inhibit viral action to reduce the severity and duration of symptoms. Lactoferrin, an antimicrobial glycoprotein found in colostrum, has antioxidant and anti-inflammatory properties and helps protect against microbial infections. Vitamin E helps to control and alleviate pain and prevent scarring. Colloidal silver, a natural antibiotic, may be applied topically to help heal the rash. If you do get shingles, be sure to keep the rash covered, avoid touching or scratching the rash which can cause scarring, and wash your hands often to prevent the spread of the virus. Avoid contact with pregnant women, premature infants and people with compromised immune systems. l-Lysine by Pure Encapsulations – As an essential amino acid, l-Lysine provides nutritional support for the body’s defense systems, supports healthy protein synthesis and arginine production and promotes calcium absorption. Gluten and soy free, Non-GMO vegetarian formulation. Vitamin C with Bioflavonoids by Vital Nutrients – These powerful synergistic nutrients enhance immune function and antioxidant activity. One capsule provides 500 mg of vitamin C as ascorbic acid along with 250 mg citrus bioflavonoid complex. Gluten free. Beta 1,3-D Glucan by Professional Complementary Health Formulas – This enhanced, bioavailable professional formula supports immune as well as cardiovascular function. E-400 Natural Vitamin E by Douglas Laboratories – This important antioxidant nutrient protects healthy cells from oxidative and free radical damage. Vitamin E helps to stabilize and protect cell membranes, red blood cells, tissues and organs. This all natural formula supports immune and cardiovascular health. Gluten, soy and dairy free formulation. Argentyn 23 Vertical Spray by Natural Immunogenics – This easily absorbed exclusive proprietary formulation provides safe and precise levels of actively charged functional silver for short and long term immune support. Gluten, allergen and GMO free, vegan formulation. This entry was posted in Home and tagged 3-D Glucan by Professional Complementary Health Formulas, Argentyn 23 Vertical Spray by Natural Immunogenics, Beta 1, E-400 Natural Vitamin E by Douglas Laboratories, l-Lysine by Pure Encapsulations, Let’s Talk Shingles, Professional Supplement Center, rash, vitamin C with bioflavonoids, Vitamin C with Bioflavonoids by Vital Nutrients, Vitamins and supplements, www.professionalsupplementcenter.com. Bookmark the permalink.